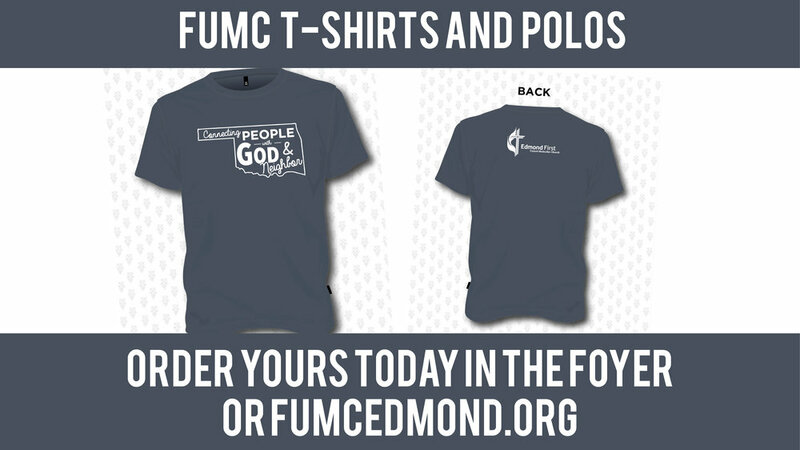 FUMC Shirts now available for order! Our mission at Edmond First is to connect people with God and neighbors. We connect with God and neighbor through worship, service, and fellowship, and one of the ways we are highlighting these connections is by raising our visibility and pride in the life of the church. It is with this in mind that we are getting new church shirts! I know, in the grand scheme of things, church shirts seem quaint at best and insignificant at worst. But these shirts help spread the good news that our church is alive in worship, active in service, and attractive in fellowship. It’s our hope that these shirts would be worn both in everyday life and specifically when you are representing our church in the community. We are offering two options in shirts. The first is a t-shirt for $10 with our mission statement on the front. The second is a polo for $20 with our church logo embroidered on it. We will be offering t-shirts in both children and adult sizes, with a special offer of buy 3, get the 4th free if you order on Sunday mornings at the welcome desk. You can also order via our website. We will be taking orders until October 29th.